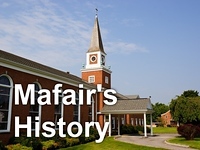 Join us at Mafair on Wednesday, September 12th as we kick off all our fall classes! A 12-week Bible study covering 1 Samuel 16 through 1 Kings 2, with discussion about applications to our lives. Led by Brian Bennett. A 7-week study that will follow our sermon series as we learn about our commitment to Christ through prayer, study, worship, witness, financial stewardship, and service. Led by Kim Goddard. Who is this course for? Anyone searching for clarity and meaning in their own life; anyone searching for meaning in their work; anyone beginning a new career or searching for a job; anyone changing jobs. What you’ll need for the class: time spent in intensive study of your life; the book 48 Days to the Work You Love by Dan Miller, 3-ring binder. Led by Jim Goddard. A handbook for Christians, defining how to go beyond looking like a cultural Christian to actually being one (much better!) as described by God’s Word, not our culture. We will look at twelve Biblical characters and the truths their lives reveal that we can apply to our own lives. We will look at failure, success, pressure, discover the “real” world, look at the presence of suffering, pain and evil in our world, how to discern God’s will and die to self. Come and learn God’s favorite word and discover that real life is upside-down! You will need the book and a notebook for this class (books available in the office for $13.99). Led by Danielle Treece. Come learn how to balance proven principles of lifestyle change with Bible study, prayer, scripture memory, the support of fellow believers, and a healthy eating and physical activity plan. Cost: $15. Led by Patricia Downs. All meals include Dinner Rolls, Dessert, and Drink. Please make your dinner reservations by Noon on Tuesdays each week, and remember that payment is expected for all reservations.